Forgot Windows 8/8.1 Administrator Password, How Do I Get to Login? Losing your Windows 7 admin password can be a nightmare. So, if you have lost your Windows 7 admin password and do not have a reset disk then follow this guide to reset your Windows 7 admin password. You can a use a command prompt to reset the login password for Windows 7. This is not a difficult task at all and can be easily accomplished if you at least have access to another admin account on your computer or laptop. If you don’t then head over to the Method 2 but, if you do then keep on reading. Just follow these simple steps to reset your Windows 7 administrator password. Click on the start button and then click command prompt. 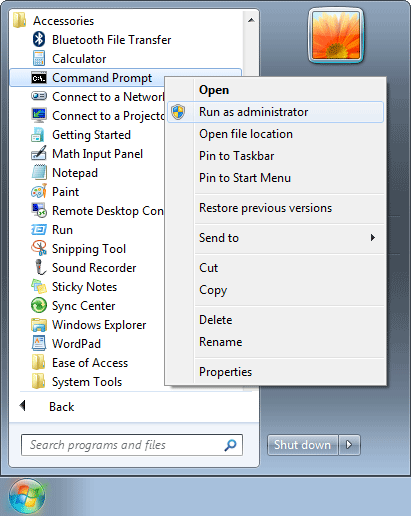 If you are unable to find command prompt in your start menu then, click the program called “run”. A small window will open up. Just type in command prompt and click run to open the program. However, you won’t need to do this if you look further into the “Accessories” in all programs. You will easily find command prompt there. Make sure that you right click on command prompt and then click “Run as administrator”. The next thing you must do is, type “net user” and then press enter. This will show you a list of user accounts on your device. Then type “net user username new_password” and press enter. This way you will able to reset your password and type in a new password for your admin account. 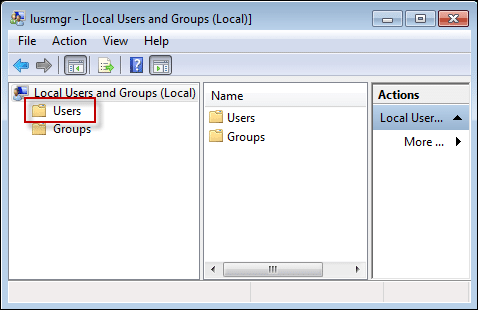 Another method to reset your Windows 7 admin password with an Install disk. To apply this method, you will obviously need your Windows 7 install disk. If you don’t have it with you then you can purchase a new one or head over to the Method 3. Use the sticky keys feature to trick your computer to launch command prompt. Sticky keys are simple shortcut keys that save you from pressing three keys at once to accomplish a simple task. When you are able to access command prompt then you can easily reset your Windows 7 admin password by simply following Method 1. 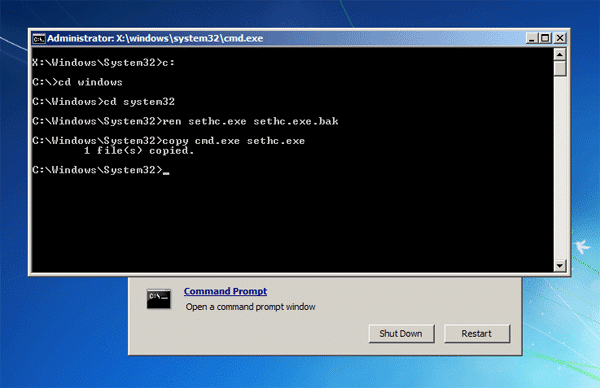 Just follow these simple steps to access command prompt. Simply restart your laptop or your computer. Then you must boot up from the Windows 7 install disk. As you do this, a keyboard and language set up will appear on your screen. At the bottom of that screen, you will find an option that will allow you to “repair your computer”, you must click that option. A list of recovery options will appear on the screen. From that list of recovery options, you must click on “command prompt”. Once, you have opened command prompt then you have the choice to either follow Method 1 or you can choose the method given below. Make sure that you press enter after each of these commands. Once, you are done with this, close all the windows then the Windows will reboot. Make sure to remove the install disk before the process of rebooting starts otherwise, you will end up rebooting the DVD containing the contents of install disk as well. When the login screen appears, press the shift key five times. This will open a fully authorised command prompt for you. Type and enter this command given below to change Windows 7 password: “net user user_name new_password”. If none of these methods work then the Windows Password Recovery Tool will help you to reset your Windows 7 password and regain access to your account. To use this method, use another PC to download Windows Password Recovery Tool. Burn it in an empty USB or a CD/DVD. Then use the USB or CD/DVD to boot your Windows 7. After this, the next thing that you have to do is to select the user account for which you want to change your password. Click on that user account and then click “reset password”. This way you will be able to unlock your account and reset its password to blank. 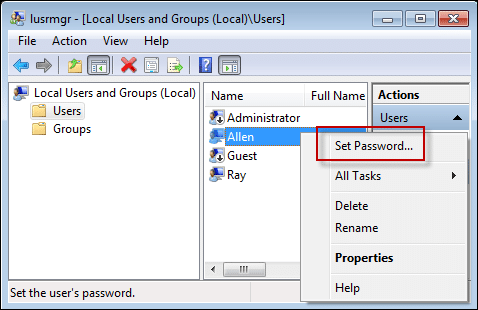 This is a rather simple method to reset your Windows 7 administrator password. This method will also require you to enter the laptop through a second administrator account. Login to that account and open the start menu. Then type “lusrmgr.msc” in the search bar and then press enter. As you do this, the Local Users and Groups will open. Type password and provide confirmation to proceed further. Double click the “users” option. Right click on the account for which you want to change the password. Click reset password and then set up a new one. Confirm your new password and logout to login your account with your new password. 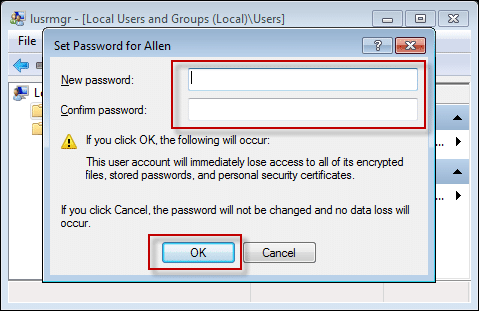 By following these simple methods, you will be able to reset your Windows 7 admin password in no time. Make sure to save your password at a trusted place you will not forget to avoid all the hassle next time.